By now, you should already know one of my hobbies is flying RC machines, either quadcopters or planes. My quadcopters fly, but due to imperfections they aren’t locked in. I used to cut two plates out of aluminum using wood cutting tools, drill holes with my hand-held drill and screw it all together. Needless to say the arms weren’t always square to each other. I yearned for more precision. Enter the ShapeOko. 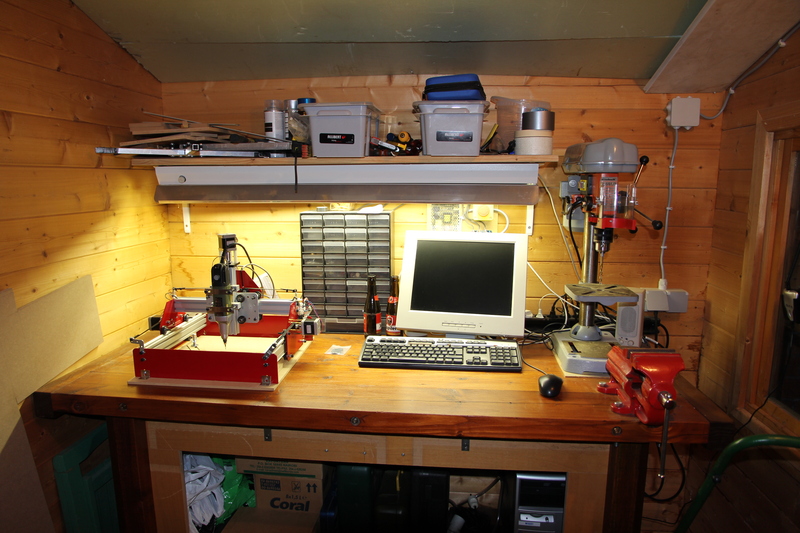 This little CNC machine, developed by Edward Ford, appeared on Inventables in April 2012. I immediately ordered a mechanical kit. This included just the mechanical parts, no electronics. This thing needed to be imported from the States, so I could avoid some tax duties by chosing to source the electronic parts within the EU. Since that video, everything was moved to my garden shed, where I wasn’t bothered by dust created by milling wood. I needed a system to hold down the piece of material to be milled. I decided to use captive nuts in a 20 mm waste board. The holders itself are made of 3 mm MDF, which is sufficient for now, but I will make them out of something stronger later on. How great the ShapeOko might be, it seems to be designed for light work. And I mean light work, like pen drawings! As soon as you attach a milling tool, the machine shows its weak side: slack on at least two axes, y and z. Luckily a lot of changes, developed by the community, can be made in order to stiffen it. Around this point I started regretting not having waited for the eShapeOko. This machine is based on the ShapeOko, but is made by a guy in the UK and it offers a lot of upgrades when ordering it. The upgrades I will describe below, are available immediately when ordering a eShapeOko… It might seem more expensive than the ShapeOko, but you need to include shipping costs and import taxes! So everyone in the EU who wants a better ShapeOko should really be buying an eShapeOko, sorry Edward. The first upgrade I did was installing a second Y axis motor. Without it the left side of the Y axis gets dragged along by the right side (with the motor). Perfect circles were impossible, this is just unacceptable! So this upgrade is a must! While I was installing the second motor, I also moved the Y belts to the outside. This required some extra parts, like smooth idler wheels and some belt, which I bought from Makerslide Europe (the eShapeOko shop). This increased the possible part size from about 19×19 cm to 21×21 cm. I’m still struggling with the Y belt tensioners though. Because the belts are further outside, the ShapeOko belt tensioners don’t really fit anymore. I still have to find a good solution for that. I make my models in AutoCAD. Thus far I’ve only mastered 2D design. Then I import the drawing (exported as dxf file) in CamBam which generates the Gcode. I double check the Gcode in OpenSCAM and send it to the ShapeOko using Universal Gcode Sender. I have yet to learn 2.5D design (as the ShapeOko can’t do real 3D). This software chain will be updated as soon as I do. The Arduino that interprets the Gcode and controls the ShapeOko motors, is running Grbl v0.9a Build 2013-03-19. The Z axis can’t have the same speed as the X and Y axes, due to the different way of driving them (screw vs belt). This Grbl build lets you set different acceleration parameters for the different axes, which wasn’t possible with previous builds. I managed to increase the X and Y seek rate significantly, while leaving the Z axis untouched. This spares a lot of time while milling! Until now I’ve only milled MDF. Next step is milling Lexan (polycarbonate) which will be a challenge to avoid melting the plastic. I’ve also found some 1.5 mm FR4 (PCB material) that I will use for a spider quad.